You must already know Sony is a manufacturer of electronic and digital camera manufacturers are creative and innovative. If you are a fan of sophisticated cameras and a variety of interesting features, then you have an interesting selection of Sony, the Sony Alpha DSLT-A58. The launch of this camera is surprise consumers and observers photographic, apparently Sony Alpha A58 DSLT-presented as a replacement for the two cameras simultaneously DSLT, Sony Alpha DSLT-A37 and Sony Alpha DSLT-A57. 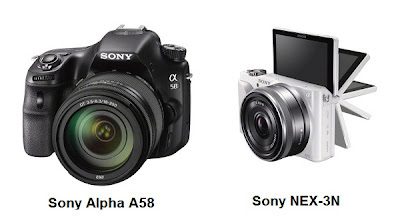 Apparently Sony to make Sony Alpha DSLT-A58 is to simplify the beginner and intermediate grade cameras from Sony. Sony Alpha DSLT-A58 is Sony's first camera with support DSLT TRILUMINOS Color technology. This technology will display the results of your photos and videos with a color that is more real when Sony Alpha A-58 you connect to a Sony Bravia TV. If you have a Sony Bravia TV, the Sony Bravia also supported TRILUMINOS Color technology. It is unfortunate that this technology you can only find on the Sony cameras only. Are there any other cameras that will follow this Sony technology? If you look closely, the Sony Alpha DSLT-A58 has similar features with the Sony Alpha DSLT-A57. However, you do not need skeptical because there are also some new features. 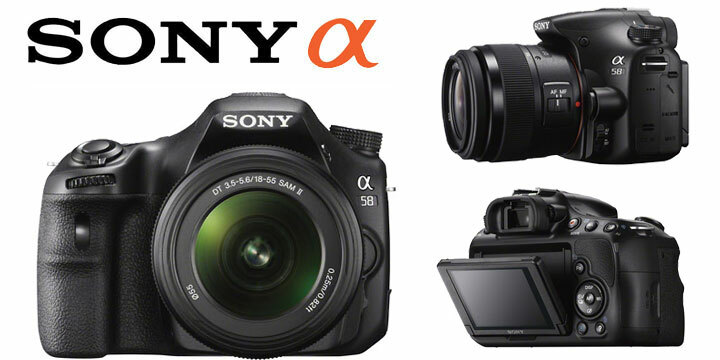 Sony Alpha A58 DSLT-armed with Exmor APS HD CMOS sensor with 20.1 megapixel resolution and is powered the latest BIOZ. The combination sensor with BIONZ processor is claimed to be the latest Sony will be able to produce sharp images with minimal noise even at high ISO. This reliable digital camera is also able to record video in Full HD 1080p resolution. You can rely on this camera for shooting fast action, with the speed of continuous shoot at 8 frames per second. Is it still not fast enough? To help shoot photos in low-light conditions, Sony has prepared a vibration dampening feature SteadyShot INSIDE is directly embedded in the camera. Sony Alpha A-57 also features an electronic viewfinder OLED tech. You can also enjoy the flexible LCD screen 2.7-inch size that can be folded around. This camera has a 15 point autofocus system. If you want to make creative photo, then you use a filter effect feature that consists of 15 art filters and Sony deliver a surprise because this camera has new features such as lock-on mode Auto focus and Object Framing. Auto Framing Object is a feature that was developed from Auto Portrait Framing. This feature you can use to get the images of men (model) with the exact composition automatically. Differences with Auto Portrait Framing Object Framing is, so now you can make a crop or automatic cuts in almost every shot of your subject from one person, two people, even though the subject is moving. This feature is supported by Pixel Super Resolution technology. A use advanced features is to maintain the quality of the crop still looks sharp in accordance with the original. Perhaps you also need to consider the camera Sony NEX-3N, a mirrorless camera with a smaller size, so comfortable you when on vacation and daily activities. Sony Alpha A-58 is certainly going to get competition from Canon, Nikon and Olympus and Panasonic. You are free to make choices fit your needs and budget. Now the camera technology was developed with a range of innovations to all camera manufacturers in the world.